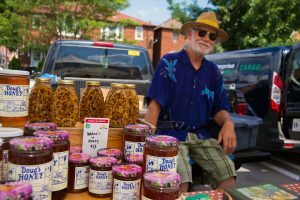 PHOTO BY GEREMY BORDANARO/GLEANER?NEWS: Doug Eiche (background) sells his honey at the Bloor-Borden Farmers’ Market. An initiative of the Harbord Village Residents’ Association, the market runs every Wednesday until Oct. 19 from 3 to 7 p.m. out of the Green P parking lot just south of Bloor Street between Borden and Lippincott streets. The market’s 22 stalls also offer bread, vegetables, meats, wines, and fruits from a variety of producers. Founders of the popular Bloor-Borden farmers’ market are concerned that they will be unable to run the market for much longer if their provincial grants continue to decline. Now in its ninth year, the market operates every Wednesday until Oct. 19 from 3 to 7 p.m. out of the Green P parking lot just south of Bloor Street between Borden and Lippincott streets. The residents’ association receives approximately $3,000 annually from Farmers’ Markets Ontario (FMO), a provincially-funded organization, to run the market. That amount covers towing parked cars from the area, a market manager’s salary, and liability insurance. The HVRA and Annex Residents’ Association also each contribute $500, which goes largely towards advertising and musicians’ fees. “The market has to sustain itself,” said Catherine Clark, FMO’s Membership, Outreach and My Pick manager, adding that sales are better at the [Bloor-Borden market] than at the other two Toronto markets the organization funds. But despite all evidence that the market is thriving, Sinclair insists that the funding is not enough. Clark noted that other markets have musicians, but not to the same extent as Bloor-Borden, which is as much a weekly mini-festival for the community as anything else. Every Wednesday, he pipes open the market with his bagpipes, after which other musicians take over to perform for the shoppers. It’s a different group each week. There’s an ersatz public square in the centre of the market with tables and chairs where anything non-political, not-for-profit, and/or good for the community goes. It’s also a spot for special visitors. And, it’s hard to know if the enhancements are what accounts for the number of shoppers visiting the thriving market each week. The HVRA also works hard to promote the market, even with its declining budget. “We got little signs made in colour, bought stakes which I’ve sharpened, and then we put them around. These are up all summer,” said Sinclair. Clark, who said that she expects the Ontario Ministry of Agriculture, Food and Rural Affairs to “slash” funds again next year, is hopeful that the market will find a way to continue. Despite repeated requests, the Ontario Ministry of Agriculture, Food and Rural Affairs did not provide a reason for decreasing its funding to Farmers’ Markets Ontario. Abigail Dancey, who is with the ministry’s issues, media and editorial services department, did write in an email that “our 2016 Budget reaffirms the importance of the Ontario agriculture and agri-food sector in the province of Ontario. Our government continues to support local food initiatives with a $6 million investment over three years to the Greenbelt Fund to deliver programming across Ontario, including the new Local Food Investment Fund”.